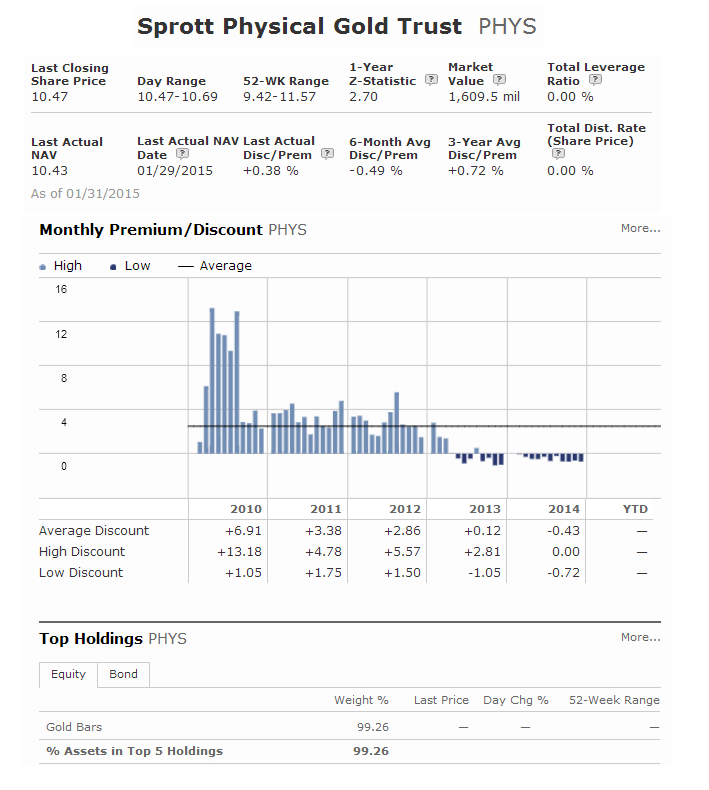 Sprott Physical Gold Trust (PHYS) is a popular gold closed end fund with $1.6 billion of assets. It invests in physical gold bullion. The fund objective is to provide an exchange traded alternative for investors interested in gold commodities. This commodity fund is managed by Peter Hodson. Its net asset value (NAV) price is $10.43 per share. The market price is trading at 2.49% premium to its NAV. The total expense ratio fee is 0.35% per year. The fund management is Sprott Asset Management LP. Morningstar has not ranked this Sprott Physical Gold Trust. In 2014, the total 1 year return is -1.91%. This gold fund has returned 2.99% over the past 1 year, and -10.87% over the past 3 years. This Sprott Physical Gold Trust has 3 holdings in its portfolio. The top 3 holdings are gold bars, US dollar (USD), and Canadian dollar (CDN). Top 2 sectors are gold bullions (99.43%) and net current assets. This Sprott Physical Gold Trust Fund provides opportunity for investor to invest in gold bars. It is traded at slightly premium to its NAV.